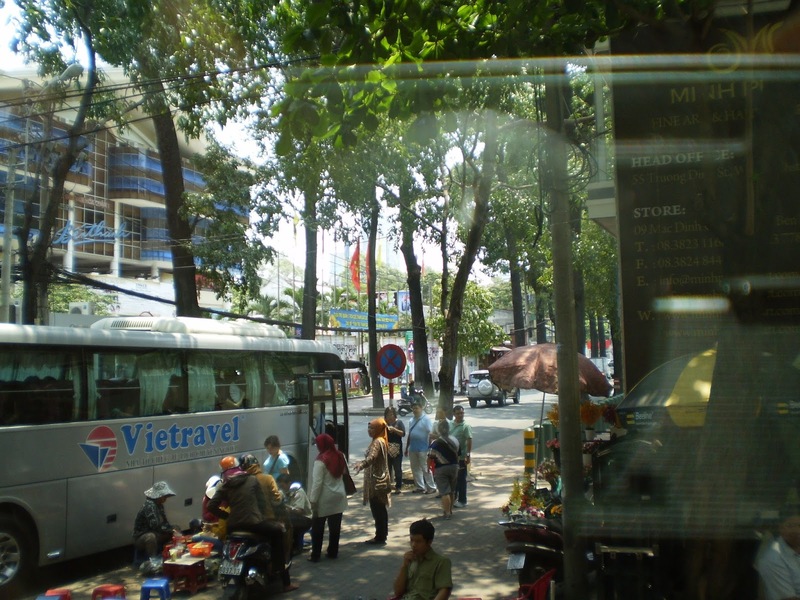 The tour, Ho Chi Minh City Highlights, began in Phu My and a long (2+ hours) bus trip from the port to the city. The distance may not be so great but the traffic was heavy. Our guide, Tuan, kept us entertained and amused with information and some jokes – one joke pertaining to the so-called “Condom Trees” (Rubber Trees) that lined the highway from the port to the city. It was a long involved story suitable for Reader’s Digest! I could probably remember it but it was such a shaggy-dog tale that went on and on. Clearly he (Tuan) had told it before as it lasted most of the way. All along the highway were coffee/refreshment shops. Part of the deal in these places are the hammocks; rows and rows of hammocks where, after your meal you can have a nap for as long you wish. I imagine you’d have to pay for the privilege. The population of Saigon is estimated at 10million and there are approximately 6million scooters and motorbikes. The most popular scooter is one made in China and available for the Dong equivalent of $300 (Australian). There are approx. 20,000 Dong to the Aussie dollar. The scooters come at you from every direction and the trick, when crossing the road, is to set your course and not waver one iota! The drivers avoid you so, if you jump out of the way or something like that, you will be hit for sure. The weather in Saigon was hot and humid. Apparently, when we were there (in March) the tourist season is coming to an end and the really hot weather is about to start. Tuan explained that once the tourist season ends so does his job. The wages are low and the population is still expanding as it has been since the end of the war. Farming is the main source of income and the fertile land produces up to three crops a year. Coffee is the major export with rice a close second. Tuan explained he came from a farming background and only started learning English as a young man in his late teens/early twenties. There is not much future for those who cannot speak English. Tuan taught us a few handy phrases to use – one of which was sing-a-song to be used when you need the loo! Some of the other phrases were a bit tricky for someone as language-challenged as I am but nodding and smiling seemed to be OK. The main Post Office was high on the list of where we absolutely had to go. The reason became clear once we got there … that’s where the authorised money changers hang out. I made my solitary purchase in the hawkers alley there – two wine holders shaped like the crescent moon and painted with a delicate pattern. The History Museum is a fascinating place and the antiquities on show are extraordinary; many are incredibly beautiful and, to my mind, reminiscent of ancient Greek and Egyptian sculptures. We visited the former Presidential Palace now known as Reunification Hall which became famous when a North Vietnamese tank crashed through its front gates on April 30th 1975, signalling end of the Vietnam War. We were taken through the bomb shelters under the Palace where many of the maps and some of the old telephones are on display. I found it spooky and couldn’t wait to get out into the open air again. I believe we visited the Jade Palace but I have no recollection of it at all! Many of the people (particularly the women) wear masks. I, along with most of the others on the tour bus, thought this was because of the pollution but … according to Tuan … it is to keep the facial skin pale! He said they take the masks off at night and there is still pollution but no sun! Quick thoughts on Saigon/Ho Chi Minh City: Noisy, dirty, scary, fun, traffic, slums.